BALTIMORE, Md. — After a week away, the birds are finally home. "It feels great. It’s one of the best days of the year here. 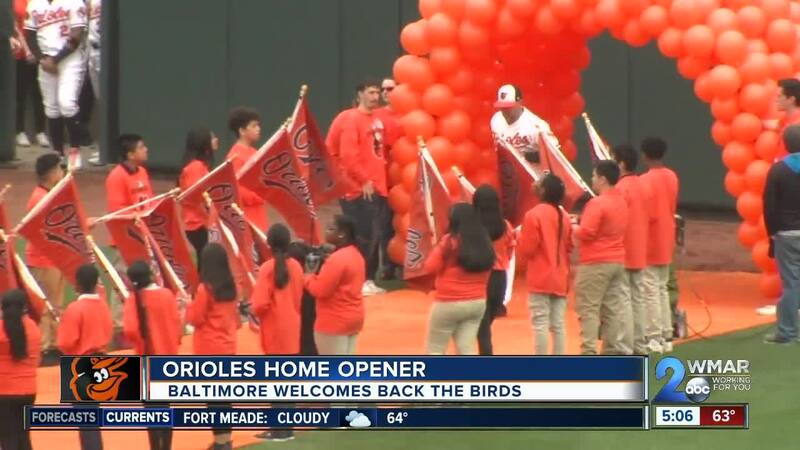 Kind of a city holiday," said Trey Mancini, Orioles Outfielder. For much of the rebuilt roster it’s the first time in front of the home crowd. "You get to embrace the home of Baltimore and get all the fans out and hopefully go out and win this game," said Martin. Opening Day, a long time coming for Rookie Manager Brandon Hyde. "Any time you have a home opener we’re excited for our fans, to hear some cheers for us. Came off a good road trip and feel like we want to keep it going," said Hyde. The results on that season-opening road trip, not what many expected from Hyde and the O’s. Winning both of their series away from Camden Yards. "We’ve just been playing in some adverse situations and tough places to play the last six games and to play in front of your home fans, we know how much these people care about our club," said Hyde. "Not really. We don’t really listen to any outside noise at all. We know what was predicted for us this year but we’re going to keep playing like we have been," said Mancini. "No one talks about us. No one believes in us but we’re going to be playing hard. We’re going to be going out pretty much every day and do the best we can to win games," said Jesus Sucre, Orioles catcher. "To come back home with a 4-2 record and having won both of those series on the road, we’re in a good spot," said Davis. The Yankees won 8-4 in a comeback win.